Product #60787 | SKU 996354105 | 0.0 (no ratings yet) Thanks for your rating! 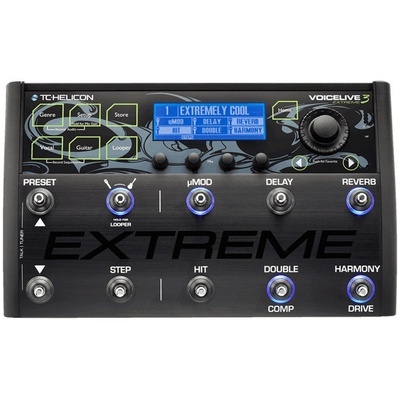 The TC-Helicon V oiceLive Extreme 3 Guitar/Vocal Effects Processor and Looper is designed for live performance and recording applications, providing extensive vocal effects, guitar stompbox effects, and over 180 minutes of phrase looping in a durable extruded-aluminium footpedal chassis. The unit offers 11 independent effect blocks, over 180 different styles, and over 250 factory presets. It also provides storage for up to 500 presets and the option to download additional presets online for free. Once you'Voe tooled around with it, you'll find it a very powerful resource—more than enough to enliven a set of solo singer/songwriter material; and that's just one of its many uses. On the vocal side, the pedal can be used to correct pitch, adjust tone, gate, compress, AEQ, add reverb, and add harmonies. Three different harmony modes allow you to control the specifics of harmonisation. Moreover, harmonies can be generated based on a variety input signals, such as built-in room microphones, a 1/4" input jack, a stereo 3.5mm input jack, a 5-pin DIN MIDI connection, and more. This allows you to create realistic three-part harmonies as determined by the chords you're playing on a guitar, a piano, backup track, or a MIDI instrument; it also allows for a degree of improvisation and exploratory meandering in musical motifs. The pedal can also be used to loop both guitar and vocal phrases with quantisation to a metronome, infinite overdubs, recallable presets, and up to 45 minutes of non-volatile memory. It offers three-phrase looping, allowing you to build different sections of a song as you go along—particularly useful if you'd like to alternate between verses, choruses, and bridges in your live music. With the three-phrase looper, you can play such songs while building up the arrangement as the song progresses. You'll also find the VoiceLive 3 Extreme's backing-track import quite useful, as it will let you automate effects ahead of time for over 100 pre-programmed tracks. With this feature, you won't need to tap dance about the stage to stomp on your distortion/phaser/reverb pedals at the same time—the pedal will transition to the proper effect automatically, for both guitar and vocals. The pedal features dedicated stereo vocal and separate stereo guitar amplifier outputs for connecting to a PA and guitar amplifier respectively. A specially designed guitar and headphone cable allows for connection to an in-ear monitoring system and enables practice without the need for an external amplifier. Have you ever stumbled over the three different pedals you need to press simultaneously to get the desired effect for the chorus? That won't happen with this feature, which allows you to prepare every FX change, harmonic shift, and loop ahead of time, thus allowing you to connect with your audience more. This feature is available for more than 100 songs. An on-board audio recorder allows you to your performances in 24-bit quality. Record every live performance and every practicing session straight to a USB stick. Whereas the VoiceLive 3 gives you 45 minutes, the Extreme version gives you over 180 minutes of looping. That's 4x the looping (the "x" is for "extreme").